In the midst of the Jallikattu agitation the 62-year-old southern superstar trained in karate dealt a strike straight in the stomach. There is anger in Tamil Nadu and at the centre of it is Jallikattu, the centuries-old tradition of taming the bull that is unique to the state. Vociferous calls for revoking the Supreme Court ban on the sport reached a crescendo following which Chief Minister O Paneerselvam met Prime Minister Narendra Modi in New Delhi last week to secure the Centre’s support for a state ordinance allowing the conduct of Jallikattu. All seemed to have ended well with the Tamil Nadu government issuing an ordinance over the weekend allowing for Jallikattu and the sport conducted across the state on Sunday, but protestors have refused to call off their agitation till a permanent solution is found. On Monday, as was feared, violence broke out in Chennai and elsewhere. In the midst of all this turbulence, the ubiquitous biryani suddenly, and quite unexpectedly, had the spotlight briefly turned on it by none other than Southern superstar Kamal Haasan. His point is that while Jallikattu is about taming the bull, and not harming it, for biryani animals have to be slaughtered. That’s a strike straight in the stomach from the 62-year-old actor who is trained in karate. The impact of a ban on biryani, hypothetical as the thought is, would be felt across India, given that the biryani economy is spread from Kashmir to Kanyakumari. Why, there is even a Naga version of the classical biryani. The sceptic can look up “peri peri Naga chicken biryani” that is cooked with “very spicy” Naga pickle. History, politics and geography, if there is one dish that has been impacted by it all it is the biryani. The origin of the biryani in India remains a subject of debate. A legend goes that Shah Jahan’s wife, Mumtaz Mahal, came up with the dish in the 1600s to feed the undernourished Mughal army. Another theory is that it came to India with Turco-Mongol conqueror Timur’s invasion in 1398. Some say the Mughals brought it here from Persia. Others insist that it came to South India first with the Arab traders. Today, the dish prepared with long-grain aromatic rice and a variety of spices is found across the country: from the bylanes of Lucknow and Old Delhi to the kitchens of five-star hotels. During the course of its journey to different parts of India, it has adapted to local flavours -- and circumstances. For example, when Awadh’s last nawab, Wajid Ali Shah, was exiled in 1856 to a Kolkata suburb, his personal chef gave it a humble twist with potatoes as the poor households could not afford meat. It is today a Kolkata specialty prepared primarily with potatoes and eggs. Then there is the Hyderabadi biryani that developed under Asaf Jah I, one of Aurangzeb’s governors, and which originally used only goat meat. There is also the Bohri biryani that is rich in tomatoes. Popular in Haasan’s state Tamil Nadu is Dindigul biryani that uses curd and lemon juice to give it a tangy touch. And though there is also the vegetarian biryani, purists will insist it doesn’t count. Such is the biryani’s popularity that even a coffee chain like Café Coffee Day couldn’t help but include it in its menu. So now, it has chicken biryani sitting alongside its range of coffee. The extent of India’s biryani economy is anybody’s guess -- perhaps even unfathomable, just like the idea of banning it. 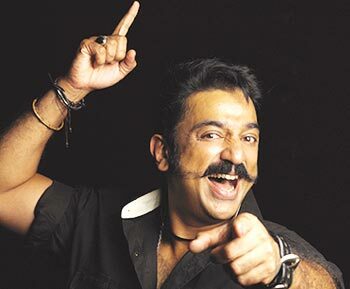 Haasan’s office turned down a request for an interview with him on the subject. The actor, his office said, has already expressed his views and is not willing to discuss the matter further. For the moment, then, the biryani survives.